Australia said today that a naval troop carrier would ferry to Papua New Guinea hundreds of stranded asylum seekers to whom it denied entry on the next stage of their odyssey. Bank loan defaulting has rocked three main political parties contesting the coming General Election in Bangladesh. Nomination papers of 143 candidates, of whom about 100 are bank loan defaulters, have bee cancelled by election officials. Indonesian officials today blamed driver error for a head-on collision between two trains outside a station in West Java province, as a hospital official said the death toll had reached at least 37. Local residents look at Indonesian trains that collided in the Indonesian port city of Cirebon on the main island of Java on Sunday. At least 30 persons died and more than 40 were injured in the accident, hospital and police officials said. Two Palestinian gunmen were killed early today during an hour-long gunbattle with Israeli troops in the divided city of Hebron, witnesses and hospital officials said. Mr Edris Ashour (21), and Mr Ala al-Sa’ai (25), both belonged to the Tanzim Militia, a military spin-off of Palestinian leader Yasser Arafat’s Fatah Movement, Palestinians said. Sweden cannot provide any more information to India on the $1.3 billion Bofors gun deal, nor extradite any citizen accused in the kickbacks scandal, says a Swedish Foreign Ministry official. At least four persons, including a Shiite leader, were killed in sectarian violence in Karachi, reports here said today. Sayed Hamed Ali Rizvi, a prominent businessman and father of the head of Star World TV, Pakistan, was killed when his car was sprayed with bullets while he was driving to his son’s office yesterday. Pioneering South African heart surgeon Christiaan Barnard died in Cyprus today where he was on holiday, officials said. Barnard, who was 78, died at a hotel in the western resort of Paphos. A doctor called in by the hotel certified his death, officials said. “Dr Christiaan Barnard died this morning... The causes of death are not known but the chances are that it was a heart attack or some such nature,” Health Minister Frixos Savvides told newsmen. Gunmen killed a local legislator in Indonesia’s Aceh province, while aid workers found 11 corpses, the police and volunteers said today. The Zaini Sulaiman, a member of Aceh’s Provincial Council, was shot dead yesterday outside his house in provincial capital Banda Aceh, said police spokesman Lt. Col Sudarsono. Prime Minister John Howard told a news conference that the 433 mainly Afghan boat people would then be flown on to New Zealand and the tiny Pacific island of Nauru, which had agreed to take them in and process their asylum applications. “Agreement has been reached with the government of Papua New Guinea for the transshipment of the people from the “Tampa” through its capital, Port Moresby, and then by aircraft to both Nauru and New Zealand,” Mr Howard said. A spokesman for the Prime Minister told Reuters earlier that the HMAS Manoora, which earlier arrived off Australia’s Christmas Island, would take the migrants off “Tampa”, the Norwegian freighter that rescued them from a sinking Indonesian ferry on August 26. “The ‘Manoora’ is in position ready to begin taking people off the ‘Tampa’ this afternoon,” Howard’s spokesman said. It was expected to leave for Papua New Guinea tomorrow. Australia, where immigration is an election-year issue, and Indonesia both refused entry to the asylum seekers, who began a second week on the freighter today. The United Nations had urged Howard’s Government to let the asylum seekers land on Christmas Island on humanitarian grounds. U.N. Secretary-General Kofi Annan chided its refusal to do so. “It is not an ideal situation and I feel for the refugees who are on this ship in the heat, in containers,” he said in South Africa. But Mr Howard’s government, already grappling with crowded camps housing asylum seekers, stood firm. The “Manoora” reached the vicinity of Christmas Island this afternoon to begin preparations for the transfer. However, it has been stalled by a hearing of the Federal Court in Melbourne in which a group of lawyers has appealed for the boatpeople to be allowed to land on Australian soil. 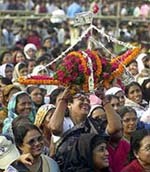 Bank loan defaulting has rocked three main political parties contesting the coming General Election in Bangladesh. Nomination papers of 143 candidates, of whom about 100 are bank loan defaulters, have bee cancelled by election officials. They were barred by a recent law from contesting the poll. Among them there are about 10 prominent leaders of the Bangladesh Nationalist Party (BNP), five candidates of the Awami League and one leader of the Jatiya Party (JP), said a report in the daily, Bangladesh Observer. JP Chairman H.M.Ershad’s nomination papers for the Sylhet-1 seat have been cancelled as he has been debarred by a court order following conviction in a corruption case. A total of 2,410 nominations papers for 299 constituencies have been found valid. Fresh nomination papers have been invited in one constituency following the death of an AL candidate. However, the final position will emerge after the withdrawal of nomination papers on September 6. Meanwhile , four BNP candidates and a JP leader have got stay orders from the Vacation Bench of the high court against the decision of the election officials. They are Tanvir Ahmed Siddiqqui, former minister under Gen Zia-ur Rahman and member of the BNP’s Central Policy-making Standing Committee, Barrister Zia-ur Rahman and Manzur Quader, former BNP legislators, and former chairman of the Bangladesh Red Crescent Society Shahidul Huq Jamal. Ms Raushan Ershad, wife of H.M. Ershad, got a stay order from the high court for loan defaulting prior to filing the nomination papers. Other BNP candidates whose nomination papers have been cancelled so far are Brig Hannan Shah, former minister under Zia-ur Rahman,Wing Commander Hamidullah, Hasanuddin Sarkar and rebel BNP candidate Eklasuddin Mollah. AL candidates whose nomination papers have been cancelled include Mustafizur Rahman, former sponsor of a bank, business magnet Aktaruzzaman Chowdhury and his son Saifuzzaman, president of the Chittagong Chamber. The nomination papers of 14 JP candidates, including party’s Joint Secretary-General Sadek Siddiki have also been cancelled. Central Bank officials worked round the clock to check from commercial banks about the bank loan position of candidates and on the basis of their report cancelled the nomination papers of around 100 candidates. The schedule for the poll in one constituency in the southern Barguna district has been changed following the death of Majib-ur Rahman Talukdar, Awami League candidate, on August 29 after filing his nomination papers. Polling will be held on October 1. This is the second parliamentary poll that will be held under a non-political caretaker government, headed by a former Chief Justice. Meanwhile, the police said it had seized nearly 5,000 illegal firearms and arrested about 90,000 suspected and identified criminals in a countrywide crackdown ahead of October 1 parliamentary election. Some of the weapons displayed by the police to the media today ranged from pistols to machine guns. The police said the arrested included 1,400 persons known to be involved in “terrorist” activities. But many of the 90,000 detained have already been released on bail, they said. “The seizure of firearms has been satisfactory and I am sure that we will be able to hold a peaceful election,” said Inspector General of Police Nurul Huda. The collision occurred at 0345 hrs local time in West Java’s Cirebon district, 200 km east of Jakarta, when an east-bound train ignored a signal to stop as it approached a station where another train was on the same track, officials said. 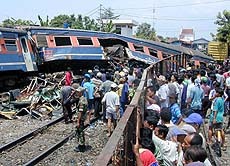 He said both drivers of the east-bound train, the Empu Jaya Express, died in the collision with the Cirebon Express locomotive. Israel is “seriously” considering pulling out of the United Nations conference against racism currently under way in Durban, South Africa, to protest what it regards as the parley’s anti-Israel resolutions, Foreign Minister Shimon Peres said today. However, a final decision will be taken only after learning the contents of Sunday’s resolutions, Israel army radio reported. Mr Peres called previous anti-Israel declarations issued at the conference “terrible, groundless and filled with hatred and distortions”, army radio reported. Palestinian delegates at the summit have asked that the declaration be adopted as part of the conference’s closing statement. The daily Haaretz, reported that Israel is trying to convince other Western countries, such as the USA, Canada and European Union countries, to withdraw their delegations in support of Israel. The USA, Canada and Israel sent low-level delegations to the conference, to protest what they see as anti-Israeli bias at the conference. Mr Peres accused the global forum of promoting hatred and anti-Semitism by branding Israel a “racist apartheid” state. A declaration adopted by a meeting of 3,000 NGOs, coinciding with a UN conference against racism in Durban, accused Israel of “systematic perpetration of racist crimes including war crimes, acts of genocide and ethnic cleansing”. Peres minced no words in his response. “It is an outburst of hate, of anti-Semitism, anti-Zionism without any consideration,” Peres told reporters in Tel Aviv. “It appears like a camp that has neither understanding nor tolerance nor a message for the future. I regret it very much,” he said. The worsening Israeli-Palestinian violence had cast a shadow over the UN world conference despite pleas by former President Nelson Mandela to seize the chance to end the “contagion” of racial discrimination. At least 550 Palestinians and 157 Israelis have been killed in a Palestinian uprising against Israeli occupation that erupted last September. After intense lobbying by Arab and Islamic states, the NGOs accused the Jewish state, in their final declaration on Sunday, of being “a racist apartheid state and its actions a crime against humanity, which have been characterised by separation and segregation... and inhumane acts”. Two Palestinian gunmen were killed early today during an hour-long gunbattle with Israeli troops in the divided city of Hebron, witnesses and hospital officials said. Mr Edris Ashour (21), and Mr Ala al-Sa’ai (25), both belonged to the Tanzim Militia, a military spin-off of Palestinian leader Yasser Arafat’s Fatah Movement, Palestinians said. They were both shot in the head, said Dr Hatem Edweik at Al Ahli Hospital in Hebron. The two men were firing on Israeli troops from the Palestinian-controlled area of Wadi-al Hariya in Hebron when they were killed, witnesses said. “About 40 Israeli soldiers came from three directions and began firing,” said Ali Jabari (22), who witnessed the exchange from his house in Wadi-al Hariya. The Israeli Army said it did not enter Palestinian-controlled territory. On August 24 Israeli forces entered Palestinian-controlled Abu Sneineh neighbourhood and destroyed two houses they said were used by gunmen to shoot towards Jewish settlements in central Hebron. 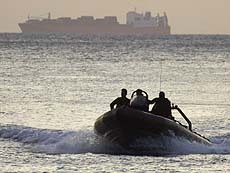 In the late-night incursion the Army and Palestinian gunmen battled each other for hours from the houses and rooftops of Wadi-al Hariya. An Israeli soldier and 12 Palestinians — five civilians and seven gunmen — were wounded in a gunbattle that followed. Earlier, a Palestinian woman was killed last night and four injured in an explosion in a taxi near the West Bank town of Tulkarem, Palestinian officials said. The cause of the blast was not immediately known. Jerusalem: An unknown Palestinian group has responsibility for the assassination of a top Palestinian intelligence officer that had been blamed on Israel. The “Bilal al-Ghul martyr group claims responsibility for the killing of traitor Tayssir Khattab by placing a bomb in his car,” said a statement received by AFP. “There is nothing more that the Swedish Government can provide the Indian authorities, investigating alleged criminality in the Bofors howitzer deal of 1986,” the official said here on condition of anonymity. “We have repeatedly, and categorically, informed the Indian authorities that every available evidence material in our possession regarding the Bofors deal has been officially handed over to the relevant authorities in India. They know as much as we ever did and, quite possibly, much more than we ever did,” said the official. Huge kickbacks were reported in the 1986 gun deal, under which India bought 410 howitzers from Swedish arms manufacturer Bofors. India’s CBI is probing the case in which Martin Ardbo, former Bofors chief, also stands accused. “Sweden, under no circumstances, ever extradites any citizen to another country, ” the official stated. At least four persons, including a Shiite leader, were killed in sectarian violence in Karachi, reports here said today. Sayed Hamed Ali Rizvi, a prominent businessman and father of the head of Star World TV, Pakistan, was killed when his car was sprayed with bullets while he was driving to his son’s office yesterday. The slain religious leader’s son, Mohammed Rizvi, told reporters that his father was targeted for the religious beliefs. Commenting on the incident, Shia political party Tehrik-e-Jafria Pakistan (TJP) said Sunni extremists were targeting Shia professionals like doctors, lawyers and businessmen to drive them out of the city. Among those killed was a journalist working for the Kashmir Press International news agency, Asadullah Khan, who was shot dead while he was travelling on his motorbike and Anwar Naseem Chandna, head of one of Pakistan’s biggest welfare trusts, the Alamgirh Welfare Trust. Pioneering South African heart surgeon Christiaan Barnard died in Cyprus today where he was on holiday, officials said. Barnard, who was 78, died at a hotel in the western resort of Paphos. A doctor called in by the hotel certified his death, officials said. “Dr Christiaan Barnard died this morning... The causes of death are not known but the chances are that it was a heart attack or some such nature,” Health Minister Frixos Savvides told newsmen. Gunmen killed a local legislator in Indonesia’s Aceh province, while aid workers found 11 corpses, the police and volunteers said today. The Zaini Sulaiman, a member of Aceh’s Provincial Council, was shot dead yesterday outside his house in provincial capital Banda Aceh, said police spokesman Lt. Col Sudarsono. Officers suspect that separatist rebels were behind the assassination, said Colonel Sudarsono, who like many Indonesians only uses one name.